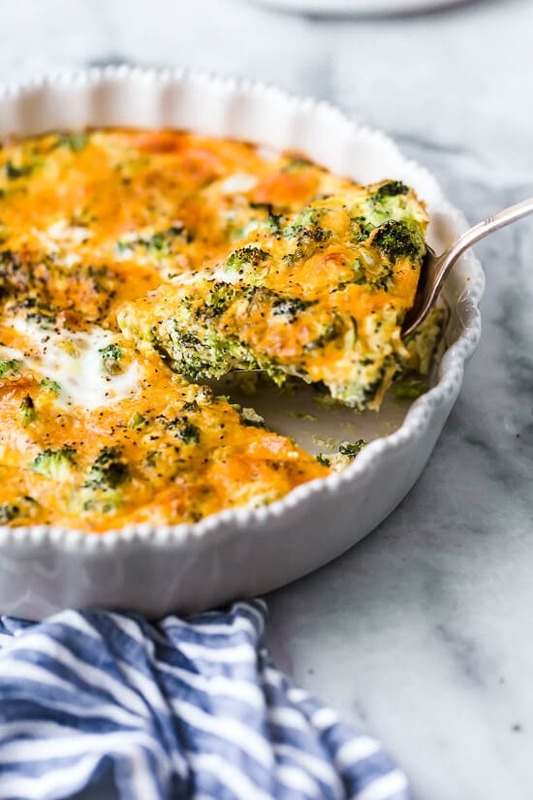 Broccoli and cheese is one of my favorite quiche combinations! 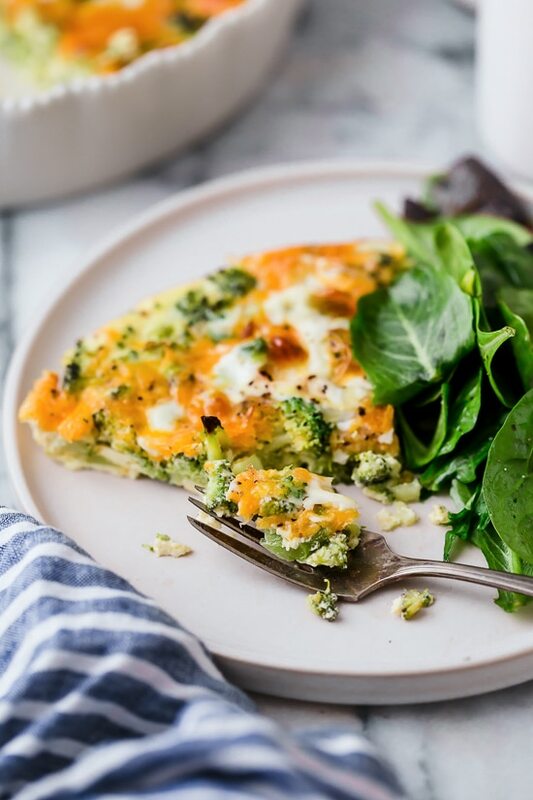 This low-carb Crustless Broccoli Cheddar Quiche is light and delicious, perfect for breakfast or brunch (or even a light dinner)! 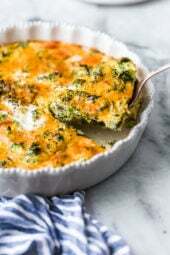 Spinach and Ricotta Quiche and Chicken Quiche are so popular on my site, but I often get asked how to make it crustless. 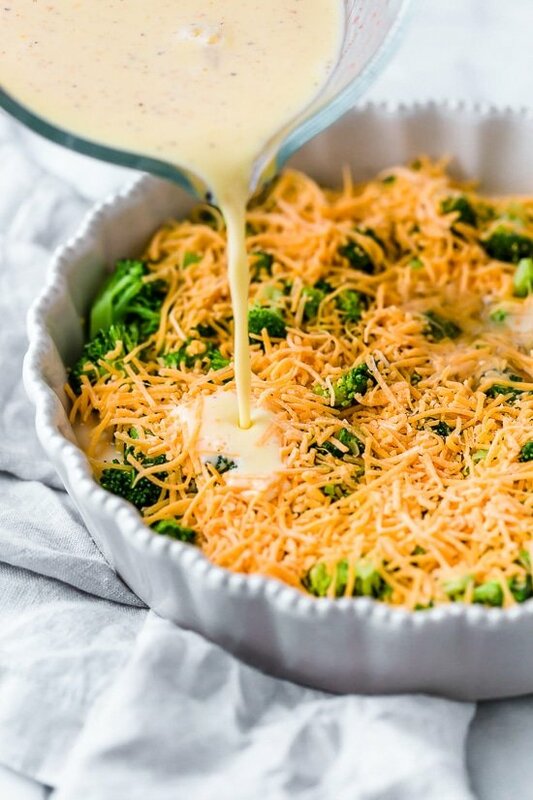 For this low-carb version, I made this with no crust, and added lots of broccoli plus I used some light cream to give the eggs more of a creamier custard texture, as most quiches have rather than a spongier baked egg texture. This turned out delicious! 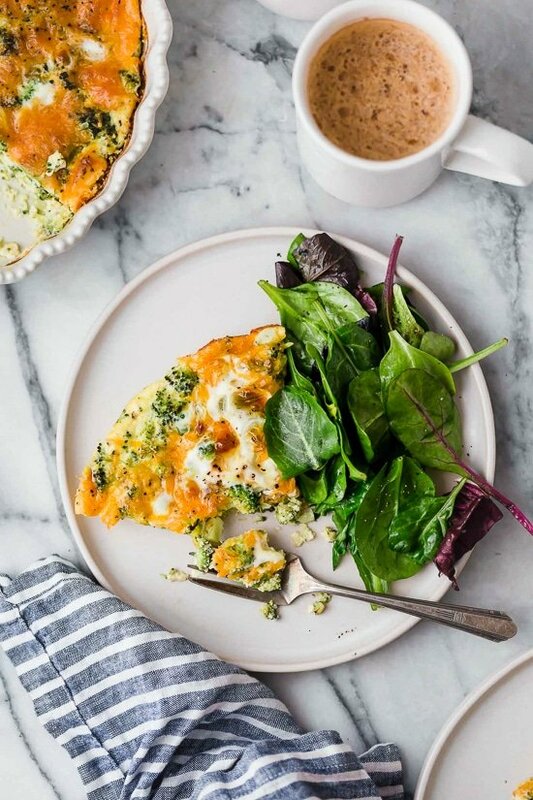 I also love this perfect for sharing, bite-sized, crustless veggie and turkey quiche. 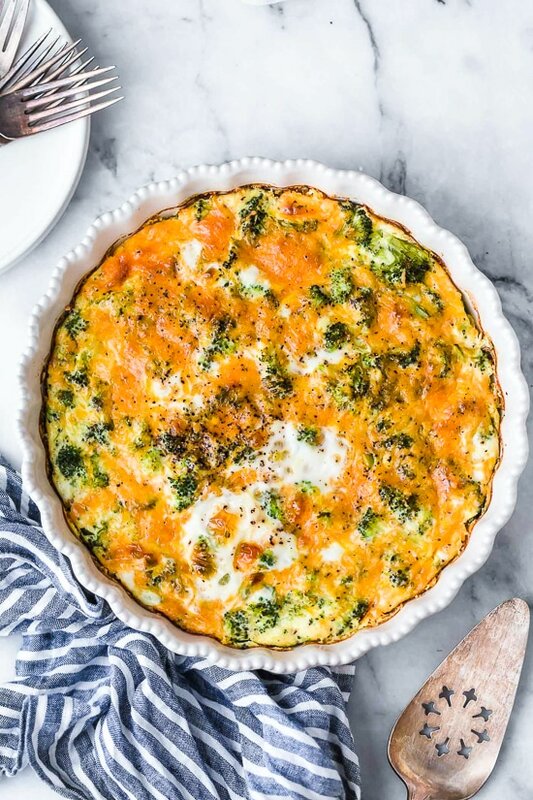 This quiche is low-carb, keto, gluten-free and easy! Add a salad on the side and it’s the perfect vegetarian lunch. You can add some diced ham or bacon and use slightly less broccoli. 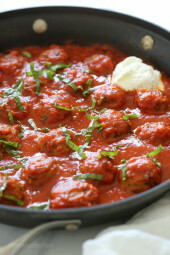 Try this with mozzarella cheese or Colby Jack cheese in place of cheddar. You can swap more milk in place of the half & half cream, but the texture won’t be as creamy, it will have a spongier texture. 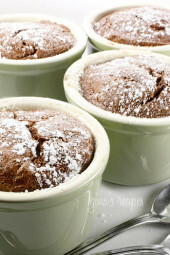 Make them in individual ramekins in place of one large pie dish. 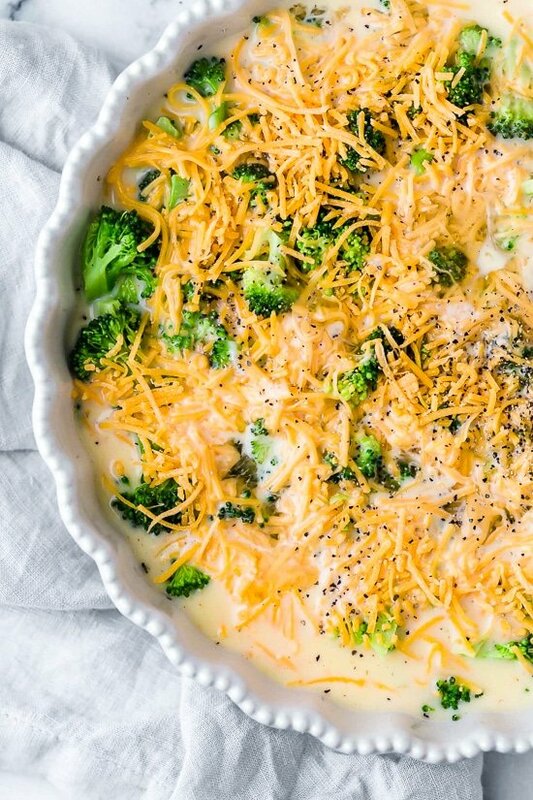 If you wish to use a crust, follow the directions for this recipe using a deeper pie dish, and use less broccoli. Refriegerate 3 to 4 days. Reheat in the microwave or oven. What are your favorite quiche combinations? Let me know! Preheat your oven to 350 degrees. Spray a pie dish with oil. Steam the chopped broccoli florets in the microwave with 1 tablespoon water until tender crisp and green but not mushy, about 2 1/2 to 3 minutes. 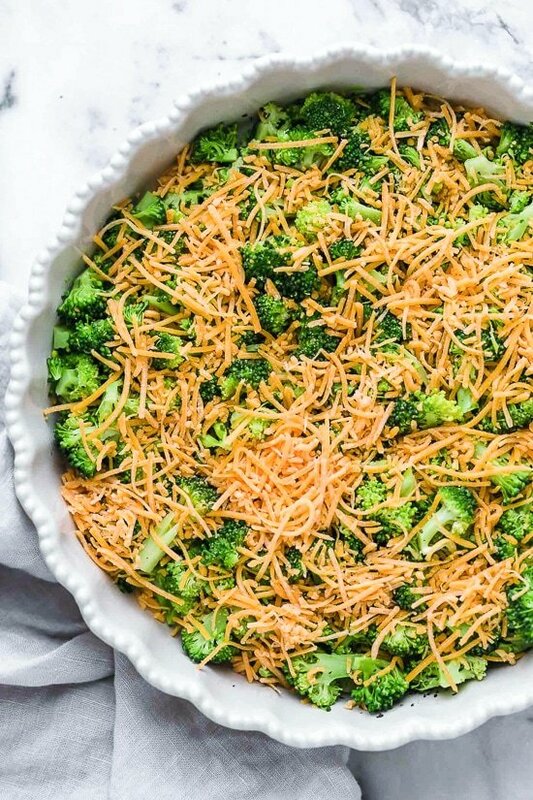 Evenly spread the broccoli in the dish and top it evenly with the grated cheddar cheese. Make the custard mixture by whisking together the milk, half and half, eggs, salt, black pepper, and the nutmeg. Pour the custard into the dish and bake 35 to 40 minutes, until the center is set. Cut the quiche into 6 pieces and serve. This is my go to when I am busy. 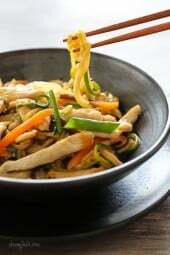 It is fast, delicious and easy peasy. I use frozen broccoli during the winter, when broccoli is quite expensive (in Canada). Love it.